Patients with transient abnormal myelopoiesis (TAM) have a variable presentation, ranging from clinically silent to extremely ill. Commonly, babies with clinically detectable TAM will have at least one sign or symptom, such as thrombocytopenia, leukocytosis, organomegaly, jaundice, and/or rash. Patients with a severe presentation can have severe liver dysfunction, indicating hepatic infiltration by blasts. Additionally, the hepatic dysfunction can result in abnormal coaugulation studies and liver function tests. There is no blast threshold for establishing a diagnosis of TAM, and the percentage of blasts in the peripheral blood (PB) may exceed the percentage of blasts in the bone marrow. The morphologic and immunophenotypic features of TAM are often identical to those of the majority of cases of acute myeloid leukemia of Down syndrome (AML-DS) (see the following image). TAM is characterized by megakaryoblasts that have cytoplasmic blebs and coarse basophilic granules. There may be an associated peripheral blood basophilia. In addition, erythroid and megakaryocytic dysplasia may be present in the bone marrow specimen. Blasts from the peripheral blood of a 1-day-old infant with trisomy 21 and transient abnormal myelopoiesis. In myelodysplastic syndrome associated with Down syndrome (MDS-DS), the blasts represent fewer than 20% of the bone marrow cells. Dyserythropoiesis associated with macrocytic erythroid cells is often present. 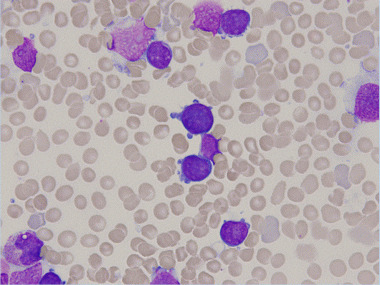 AML-DS may sometimes be associated with a leukoerythroblastic picture. The blasts are often similar to those described in TAM. There is often an associated dyserythropoiesis, as well as dysgranulopoiesis and dysmegakaryopoiesis. Bone marrow fibrosis may also be present. Cases of acute megakaryoblastic leukemia (AML, FAB M7) may show increased clusters of dysplastic megakaryocytes and micromegakaryocytes, and an increased number of megakaryoblasts, as shown in the following image. Multiple megakaryoblasts with cytoplasmic blebbing are seen in this image. The blasts of transient abnormal myelopoiesis (TAM) most commonly are positive for CD4 (dim), CD7, CD13, CD33, CD34, CD36, CD41, CD42, CD56, CD61, CD71, CD117, and HLA-DR (variable). They are negative for CD14, CD15, myeloperoxidse, and glycophorin A. Most often, these markers are analyzed by flow cytometric analysis, but immunohistochemistry for CD41 and CD61 can also be performed. The leukemic blasts in acute myeloid leukemia of Down syndrome (AML-DS) display an immunophenotype similar to that of TAM—with the exception that CD34 is expressed in only half of cases. Additionally, CD56 and CD41 are absent in up to 30% of cases. In the other AML subtypes that arise in Down syndrome, the blasts display the characteristic immunophenotypic features of that particular subtype of AML. Microarray transcript profiling is able to distinguish TAM from acute megakaryoblastic leukemia in patients with Down syndrome. Among the significant differences, CDKN2C, the effector of GATA1 -mediated cell cycle arrest, is increased in AML-DS but not in TAM. In contrast, n-MYC is expressed in TAM at a significantly greater level than in AML-DS. Tomizawa D, Kolb EA. Down syndrome and AML: where do we go from here?. Blood. 2017 Jun 22. 129 (25):3274-5. [Medline]. Tomizawa D, Endo A, Kajiwara M, et al. Acute lymphoblastic leukemia in patients with Down syndrome with a previous history of acute myeloid leukemia. Pediatr Blood Cancer. 2017 Aug. 64 (8):[Medline]. Yoshida K, Toki T, Okuno Y, et al. The landscape of somatic mutations in Down syndrome-related myeloid disorders. Nat Genet. 2013 Nov. 45 (11):1293-9. [Medline]. Bombery M, Vergilio JA. Transient abnormal myelopoiesis in neonates: GATA get the diagnosis. Arch Pathol Lab Med. 2014 Oct. 138 (10):1302-6. [Medline]. [Full Text]. Wang SA, Hasserjian RP. Acute erythroleukemias, acute megakaryoblastic leukemias, and reactive mimics: a guide to a number of perplexing entities. Am J Clin Pathol. 2015 Jul. 144 (1):44-60. [Medline]. Maroz A, Stachorski L, Emmrich S, et al. GATA1s induces hyperproliferation of eosinophil precursors in Down syndrome transient leukemia. Leukemia. 2014 Jun. 28 (6):1259-70. [Medline]. Bhatnagar N, Nizery L, Tunstall O, Vyas P, Roberts I. Transient Abnormal Myelopoiesis and AML in Down Syndrome: an Update. Curr Hematol Malig Rep. 2016 Oct. 11 (5):333-41. [Medline]. Roberts I, Alford K, Hall G, Juban G, et al. GATA1-mutant clones are frequent and often unsuspected in babies with Down syndrome: identification of a population at risk of leukemia. Blood. 2013 Dec 5. 122 (24):3908-17. [Medline]. Homans AC, Verissimo AM, Vlacha V. Transient abnormal myelopoiesis of infancy associated with trisomy 21. Am J Pediatr Hematol Oncol. 1993 Nov. 15(4):392-9. [Medline]. Brodeur GM, Dahl GV, Williams DL, Tipton RE, Kalwinsky DK. Transient leukemoid reaction and trisomy 21 mosaicism in a phenotypically normal newborn. Blood. 1980 Apr. 55(4):691-3. [Medline]. Abe K, Kajii T, Niikawa N. Disomic homozygosity in 21-trisomic cells: a mechanism responsible for transient myeloproliferative syndrome. Hum Genet. 1989 Jul. 82(4):313-6. [Medline]. Bhatt S, Schreck R, Graham JM, Korenberg JR, Hurvitz CG, Fischel-Ghodsian N. Transient leukemia with trisomy 21: description of a case and review of the literature. Am J Med Genet. 1995 Sep 25. 58(4):310-4. [Medline]. Weinberg AG, Schiller G, Windmiller J. Neonatal leukemoid reaction. An isolated manifestation of mosaic trisomy 21. Am J Dis Child. 1982 Apr. 136(4):310-1. [Medline]. Jiang CJ, Liang DC, Tien HF. Neonatal transient leukemoid proliferation followed by acute myeloid leukaemia in a phenotypically normal child. Br J Haematol. 1991 Feb. 77(2):247-8. [Medline]. Brissette MD, Duval-Arnould BJ, Gordon BG, Cotelingam JD. Acute megakaryoblastic leukemia following transient myeloproliferative disorder in a patient without Down syndrome. Am J Hematol. 1994 Dec. 47(4):316-9. [Medline]. Zubizarreta P, Muriel FS, Fernández Barbieri MA. Transient myeloproliferative disorder associated with trisomy 21, a wide range syndrome: report of two cases with trisomy 21 mosaicism. Med Pediatr Oncol. 1995 Jul. 25(1):60-4. [Medline]. Faed MJ, Robertson J, Todd AS, Sivakumaran M, Tarnow-Mordi WO. Trisomy 21 in transient myeloproliferative disorder. Cancer Genet Cytogenet. 1990 Sep. 48(2):259-64. [Medline]. Ridgway D, Benda GI, Magenis E, Allen L, Segal GM, Braziel RM, et al. Transient myeloproliferative disorder of the Down type in the normal newborn. Am J Dis Child. 1990 Oct. 144(10):1117-9. [Medline]. Frassoni F, Bacigalupo A, Marmont A, Scarpati D, Corvò R, Vitale V. Total body irradiation dose and relapse risk after marrow transplantation for leukemia. Blood. 1991 Jun 1. 77(11):2543-4. [Medline]. Kempski HM, Craze JL, Chessells JM, Reeves BR. Cryptic deletions and inversions of chromosome 21 in a phenotypically normal infant with transient abnormal myelopoiesis: a molecular cytogenetic study. Br J Haematol. 1998 Nov. 103(2):473-9. [Medline]. Richards M, Welch J, Watmore A, Readett D, Vora AJ. Trisomy 21 associated transient neonatal myeloproliferation in the absence of Down's syndrome. Arch Dis Child Fetal Neonatal Ed. 1998 Nov. 79(3):F215-7. [Medline]. [Full Text]. Langebrake C, Creutzig U, Reinhardt D. Immunophenotype of Down syndrome acute myeloid leukemia and transient myeloproliferative disease differs significantly from other diseases with morphologically identical or similar blasts. Klin Padiatr. 2005 May-Jun. 217(3):126-34. [Medline]. Lee WY, Weinberg OK, Evans AG, Pinkus GS. Loss of full-length GATA1 expression in megakaryocytes Is a sensitive and specific immunohistochemical marker for the diagnosis of myeloid proliferative disorder related to Down syndrome. Am J Clin Pathol. 2018 Feb 22. [Medline]. Kobayashi K, Yoshioka T, Miyauchi J, et al. Monocyte chemoattractant protein-1 (MCP-1) as a potential therapeutic target and a noninvasive biomarker of liver fibrosis associated with transient myeloproliferative disorder in Down syndrome. J Pediatr Hematol Oncol. 2017 Jul. 39 (5):e285-e289. [Medline]. Greene ME, Mundschau G, Wechsler J, McDevitt M, Gamis A, Karp J, et al. Mutations in GATA1 in both transient myeloproliferative disorder and acute megakaryoblastic leukemia of Down syndrome. Blood Cells Mol Dis. 2003 Nov-Dec. 31(3):351-6. [Medline]. Hitzler JK, Cheung J, Li Y, Scherer SW, Zipursky A. GATA1 mutations in transient leukemia and acute megakaryoblastic leukemia of Down syndrome. Blood. 2003 Jun 1. 101(11):4301-4. [Medline]. Magalhães IQ, Splendore A, Emerenciano M, Figueiredo A, Ferrari I, Pombo-de-Oliveira MS. GATA1 mutations in acute leukemia in children with Down syndrome. Cancer Genet Cytogenet. 2006 Apr 15. 166(2):112-6. [Medline]. Ono R, Hasegawa D, Hirabayashi S, et al. Acute megakaryoblastic leukemia with acquired trisomy 21 and GATA1 mutations in phenotypically normal children. Eur J Pediatr. 2015 Apr. 174 (4):525-31. [Medline]. Adams RH, Lemons RS, Thangavelu M, Le Beau MM, Christensen RD. Interstitial deletion of chromosome 5, del(5q), in a newborn with Down syndrome and an unusual hematologic disorder. Am J Hematol. 1989 Aug. 31(4):273-9. [Medline]. Ghosh K. Transient abnormal myelopoiesis in Down's syndrome--are some of them truly leukaemic?. Leuk Res. 1992. 16(5):545-6. [Medline]. Zipursky A, Doyle J. Leukemia in newborn infants with Down syndrome. Leuk Res. 1993 Feb. 17(2):195. [Medline]. Granzen B, Bernhard B, Reinisch I, Skopnik H, Mertens R. Transient myeloproliferative disorder with 11q23 aberration in two neonates with Down syndrome. Ann Hematol. 1998 Jul-Aug. 77(1-2):51-4. [Medline]. 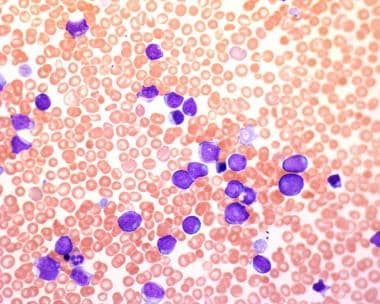 Duflos-Delaplace D, Laï JL, Nelken B, Genevieve F, Defachelles AS, Zandecki M. Transient leukemoid disorder in a newborn with Down syndrome followed 19 months later by an acute myeloid leukemia: demonstration of the same structural change in both instances with clonal evolution. Cancer Genet Cytogenet. 1999 Sep. 113(2):166-71. [Medline]. HONDA F, PUNNETT HH, CHARNEY E, MILLER G, THIEDE HA. SERIAL CYTOGENETIC AND HEMATOLOGIC STUDIES ON A MONGOL WITH TRISOMY-21 AND ACUTE CONGENITAL LEUKEMIA. J Pediatr. 1964 Dec. 65:880-7. [Medline]. Hasle H, Niemeyer CM, Chessells JM, Baumann I, Bennett JM, Kerndrup G, et al. A pediatric approach to the WHO classification of myelodysplastic and myeloproliferative diseases. Leukemia. 2003 Feb. 17(2):277-82. [Medline]. Henderson R, Spence L. Down syndrome with myelodysplasia of megakaryoblastic lineage. Clin Lab Sci. 2006 Summer. 19(3):161-4. [Medline]. McElwaine S, Mulligan C, Groet J, Spinelli M, Rinaldi A, Denyer G, et al. Microarray transcript profiling distinguishes the transient from the acute type of megakaryoblastic leukaemia (M7) in Down's syndrome, revealing PRAME as a specific discriminating marker. Br J Haematol. 2004 Jun. 125(6):729-42. [Medline]. de Rooij JD, Branstetter C, Ma J, et al. Pediatric non-Down syndrome acute megakaryoblastic leukemia is characterized by distinct genomic subsets with varying outcomes. Nat Genet. 2017 Mar. 49 (3):451-6. [Medline]. [Full Text]. Hara Y, Shiba N, Ohki K, et al. Prognostic impact of specific molecular profiles in pediatric acute megakaryoblastic leukemia in non-Down syndrome. Genes Chromosomes Cancer. 2017 May. 56 (5):394-404. [Medline]. Bista R, Lee DW, Pepper OB, Azorsa DO, Arceci RJ, Aleem E. Disulfiram overcomes bortezomib and cytarabine resistance in Down-syndrome-associated acute myeloid leukemia cells. J Exp Clin Cancer Res. 2017 Feb 1. 36 (1):22. [Medline]. Caldwell JT, Edwards H, Buck SA, Ge Y, Taub JW. Targeting the wee1 kinase for treatment of pediatric Down syndrome acute myeloid leukemia. Pediatr Blood Cancer. 2014 Oct. 61 (10):1767-73. [Medline]. Lange BJ, Kobrinsky N, Barnard DR, Arthur DC, Buckley JD, Howells WB, et al. Distinctive demography, biology, and outcome of acute myeloid leukemia and myelodysplastic syndrome in children with Down syndrome: Children's Cancer Group Studies 2861 and 2891. Blood. 1998 Jan 15. 91(2):608-15. [Medline]. Maloney KW, Taub JW, Ravindranath Y, Roberts I, Vyas P. Down syndrome preleukemia and leukemia. Pediatr Clin North Am. 2015 Feb. 62 (1):121-37. [Medline]. Gamis AS, Alonzo TA, Gerbing RB, Hilden JM, Sorrell AD, Sharma M, et al. Natural history of transient myeloproliferative disorder clinically diagnosed in Down syndrome neonates: a report from the Children's Oncology Group Study A2971. Blood. 2011 Dec 22. 118 (26):6752-9; quiz 6996. [Medline]. Gamis AS, Woods WG, Alonzo TA, Buxton A, Lange B, Barnard DR, et al. Increased age at diagnosis has a significantly negative effect on outcome in children with Down syndrome and acute myeloid leukemia: a report from the Children's Cancer Group Study 2891. J Clin Oncol. 2003 Sep 15. 21(18):3415-22. [Medline]. Uffmann M, Rasche M, Zimmermann M, et al. Therapy reduction in patients with Down syndrome and myeloid leukemia: the international ML-DS 2006 trial. Blood. 2017 Jun 22. 129 (25):3314-21. [Medline]. Hasle H, Clemmensen IH, Mikkelsen M. Risks of leukaemia and solid tumours in individuals with Down's syndrome. Lancet. 2000 Jan 15. 355 (9199):165-9. [Medline]. Megakaryoblasts of a patient with pediatric acute megakaryoblastic leukemia.